The restoration site is located on rural private property north of Moscow, ID on Foothill Road. Prior to restoration, the stream channel was straightened and its function was reduced to a drainage ditch along Foothill Rd. Reed canarygrass was the dominant vegetation and a riparian buffer was absent. Active agricultural fields were located directly adjacent to the stream. 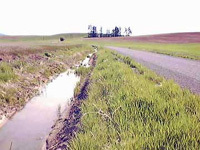 Paradise Creek’s former straightened path ran directly adjacent to a county road, leaving the creek exposed to runoff derived from a local county road. Functional riparian habitat was absent along this stretch of the stream, providing very poor habitat for fish and little cover or food sources for wildlife. Additionally, due to the lack of a vegetated buffer, this creek segment was vulnerable to receiving a high percentage of the sediments, nutrients, and/or pesticides being carried by stormwater runoff. The Creek Was a Road Ditch: When the project started, Paradise Creek was located along a county road, and functioned as a drainage ditch. Stream Remeander in Progress (August 1999): A heavy equipment operator uses a large trackhoe to create new bends in the stream. These new meanders will help increase the hydrological diversity of the stream; the bends slow water velocities and encourage the formation of riffles and pools. Completion of dirt-moving activities using heavy equipment required about a month of full-time operations. 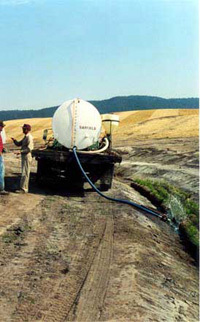 Coir Log Watering (September 1999): The landowner gives water-loving plants (called hydrophytic vegetation) growing in coconut fiber-filled coir logs a drink on a dry September day. These plants will help stabilize the streambanks and filter excess sediments and nutrients that enter the stream from surface runoff; additionally, they will provide habitat for aquatic invertebrates that act as a food source for fish and wildlife. 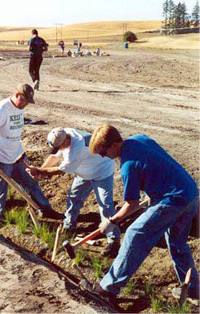 Coir Log Event Day (October 1999): Approximately 70 volunteers from the university, high schools, girl scouts, the Church of Latter-Day Saints, and community residents cheerfully labored together to restore Paradise Creek. One Mile of Coir Logs Installed in One Day! (Fall 1999): A group of volunteers from the Church of Latter-Day Saints robustly pound in wooden stakes to anchor coir logs to the toe of the streambank. Project Ready For Its First Winter (Fall 1999): Herbaceous cover was established in the Fall of 1999 to provide ground cover and maintain stream channel integrity during the upcoming winter and spring thaw.